The VWR Air Jacketed CO2 Incubator Basic delivers on both easy of use, and also high temperature decontamination for a consistent and dependable environment. This direct heat incubator has a temperature range of 3°C above ambient to 55°C (131°F), and a CO2 range of 0-20%, with fan assisted airflow for a uniform atmosphere. This CO2 Incubator creates a dependable cell growth environment, free of most contaminants, thanks to the on demand 90°C moist heat decontamination cycle. The VWR Incubator Basic has a polished stainless interior, an integrated pan for high relative humidity and dual temperature probes for over-temperature protection. This 5.3 cu ft capacity CO2 incubator also features a tempered glass door that allows users to check on their samples without disrupting the environment, and a long lasting Thermal Conductive CO2 Sensor. This 2016 VWR Air Jacketed CO2 Incubator Basic is a new scratch and dent model in its original box. Please note there is a slight dent on the bottom left hand side as noted in the picture gallery. It does not impact performance and the instrument has been tested by our service department for quality control. 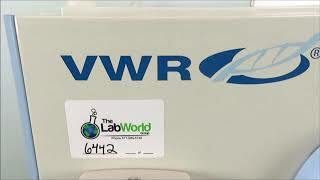 (MSRP: $9,036.84) All of our lab equipment comes backed with our standard warranty. Should you have any questions, please don't hesitate to contact us.